Dexter Daily: Michael C. Hall on Dexter Movie Possibility: "There's Been Talk, I Struggle to See It Being Worthwhile"
Michael C. Hall on Dexter Movie Possibility: "There's Been Talk, I Struggle to See It Being Worthwhile"
Having earlier done five seasons of Six Feet Under, which dealt with the morbid as well, what was it about Dexter that attracted you? Initially, I think it was the challenge of breathing a sense of authentic life into a character who claimed to be without the capacity for authenticity, or life. I think playing a character that wasn’t affable or relatable or attractive enough for viewers to understand or identify with, or even root for, was a challenge that I welcomed as an actor, and was excited about, personally. 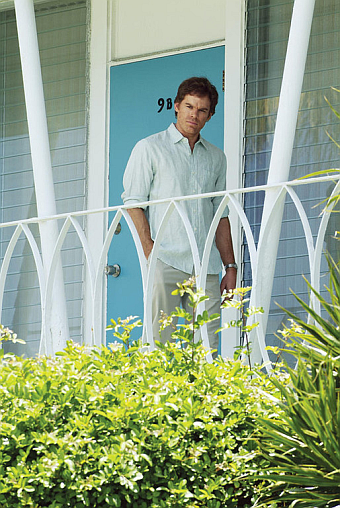 Because after playing someone like David Fisher (Six Feet Under), who struggled with a sense of self-loathing and… a sense of being a doormat in his relationships, to play Dexter who is, ultimately, a man of action and a very decisive character, was an appealing change of pace. Read the rest after the jump. You’re known to be a method actor. So was the preparation for Dexter? Did you practise murdering dolls and stalking people? Apart from this, there were some books that I read by FBI profilers who dedicated their careers to identifying the characteristics of serial killers. I imagined that Dexter himself would familiarise himself with things like that. I read transcripts of interviews with different serial killers, I sat down with the head of the Blood Splatter Analysis Department of Miami-Dade County and got a sense of what he did. Ultimately, though, I think it was a character that required an imaginative leap, you know, unless you are willing to commit felonies to see what it’s like. But, it’s not really my inclination to want to do that, so I didn’t think that would really serve me in any way. Were you worried about the responsibility that comes with playing a ‘likeable’ serial killer? There have been stories of life imitating art—how do they affect you? Yeah. It’s (pauses)… yeah, it’s a very troubling thing to hear that someone used the existence of the show to sort of contextualise some darker impulse that they might have. But I in no way think that the show is an instructional manual or advocating force for serial murders, or anything like that. I think it’s more a meditation on the nature of morality, family, love and the male psyche. The fact that people see it that way or use it to justify murderous impulses is certainly troubling, but at the same time, I believe, in this case specifically, and even generally, that to censor something because of an individual viewer’s association with it is fundamentally wrong. Did it surprise you that people like Dexter so much, given the fact that he is a criminal? Personally, do you at all judge Dexter? Do you look at him as a vigilante, a hero, a sociopath or even just a little crazy? Yeah, I knew going into the show that Dexter was only going to work if people managed to like and identify with the character, and that was sort of the fundamental tonal and performance-wise challenge that we were facing. I thought it would appeal to a certain taste and to a certain viewer. As far as the number of people it’s appealed to, or the different kinds of people who found something to like, it wasn’t something I necessarily anticipated, so it was a pleasant surprise. But no, I do not think that it’s my job or my inclination to judge the characters I play. It’s not something that I really struggle against doing, something I’m not really inclined to do. I’m more inclined to just understand what’s motivating them and act in accordance to that. Does playing Dexter ever get to you? How do you offset the ‘Dark Passenger’ after the show ends? Do you have a routine like watching mindless comedies to get over it? Mindless comedies are nice, exercise is good, hot showers are great, vacations and travelling is always nice. So, just getting some distance from the day-to-day constant preoccupation with the character does the trick for the most part. Because, yes, the show does get to you, to a degree… probably, in subtle ways that affect [not] just my mood. Simulating someone who feeds on impulses that dark, and manages a level of stress… takes its toll on the subconscious. But I guess that kind of goes with the territory if you are an actor. What have you learnt about life and death in the past decade, given that both Six Feet Under and Dexter have had these as their central themes? I don’t really know how much there is to learn about death, except that it’s inevitable. But as far as life goes, both Dexter and Six Feet Under have been very significant and enriching parts of my life, and I’m thankful for that… it’s definitely cultivated in me a sense of gratitude—gratitude to be working with talented people, gratitude to be working in general, and telling a story that I feel strongly about, probably the biggest thing. You also underwent treatment for Hodgkin’s lymphoma—successfully—during Dexter. Did that, in any way, change the way you play Dexter? A Well, you know, when something like that (Hodgin’s lymphoma) happens, you wonder, ‘Did I will this to happen in spite of myself?’ or ‘Am I behaving in ways or treating myself in ways, whether in my habits or in my mind, that contributed to this happening?’ And I was encouraged by most people to believe that wasn’t the case, but maybe it helped me do a better job of putting my work down when I was done with it (chuckles). As a producer on the show, you must be involved in the writing of the show. Do you see Dexter having a happy ending? Yeah, I’m a part of that conversation (writing), but I appreciate the fact that if a television series is successful, it’s a miracle of sorts, in as much as it requires so many people to do their jobs well. So I trust our writers and the process that they go through to come up with what happens and I don’t aspire to write the show. I think I ought to weigh in, in terms of how things happen, if there’s a story development that I feel has been executed in a way that doesn’t honour my sense of Dexter’s identity, I might talk about different ways to get there. But, thankfully, we have [such] amazing writers that I can primarily focus on doing my job as an actor. And as far as the ending is concerned, I do fantasise about a happy ending on Dexter’s behalf, you know, because it’s something that he perhaps deserves, though I honestly don’t know if that’s the way it’s going to pan out. Will we ever see Dexter as a movie? You know there’s been talk about that possibility, but I struggle to see it being worthwhile. I mean, if somebody can put something in front of me that was compelling, I would be excited, sure, but I have trouble imagining it. Have you ever used Dexter to your advantage… scared someone off in real life? Yeah, if anybody cuts me off in traffic, I just give them a little glare and they usually back down. (Chuckles) No, I try not to use that, I try to be responsible.